ChemSee's FRM-KT1 contains five Formaldehyde dosimeters, FULL USE INSTRUCTIONS and in-lab analysis by ChemSee. Together, these two items allow for rapid, quantitative analysis of air for the presence of Formaldehyde. ChemSee’s Dosimeter: Formaldehyde detects Formaldehyde in the range of 0 to 5 ppm*hr. 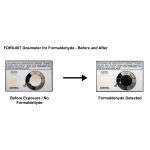 To determine the total exposure of the indicator to Formaldehyde, compare the color formed during testing to those provided on the dosimeter. 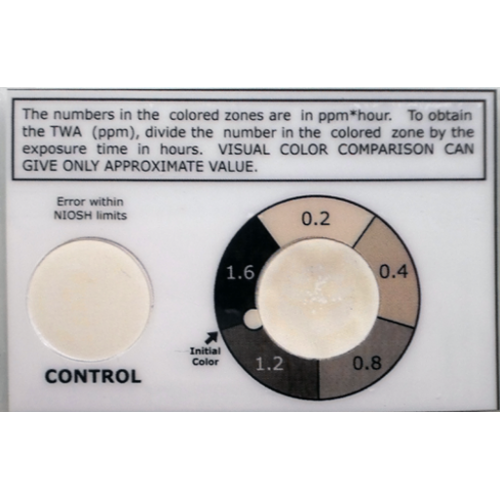 Divide the ppm*hr value on the card by the total exposure time to determine the average amount of Formaldehyde is the air during the trial period. Formaldehyde is an organic compound with the formula CH2O. A gas at room temperature, formaldehyde is colorless and has a characteristic pungent, irritating odor. In view of its widespread use, toxicity and volatility, exposure to formaldehyde is a significant consideration for human health. On 10 June 2011, the US National Toxicology Program described formaldehyde as "known to be a human carcinogen". Formaldehyde is highly toxic to all animals, regardless of method of intake. Ingestion of as little as 30 mL (1 oz.) of a solution containing 37% formaldehyde has been reported to cause death in an adult human. Water solution of formaldehyde is very corrosive and its ingestion can cause severe injury to the upper gastrointestinal tract. Occupational exposure to formaldehyde by inhalation is mainly from three types of sources: thermal or chemical decomposition of formaldehyde-based resins, formaldehyde emission from aqueous solutions (for example, embalming fluids), and the production of formaldehyde resulting from the combustion of a variety of organic compounds (for example, exhaust gases). Formaldehyde can be toxic, allergenic, and carcinogenic. Because formaldehyde resins are used in many construction materials it is one of the more common indoor air pollutants. At concentrations above 0.1 ppm in air formaldehyde can irritate the eyes and mucous membranes, resulting in watery eyes. Formaldehyde inhaled at this concentration may cause headaches, a burning sensation in the throat, and difficulty breathing, and can trigger or aggravate asthma symptoms.